Jose Luis Lopez Ruiz is a name that you’re probably familiar with if you’re an active armor modeler who is up to date on the various finishing techniques used today. His pioneering use of the “Black and White” technique was a real eye-opener for modelers used to following a fairly standardized process of color application and weathering. 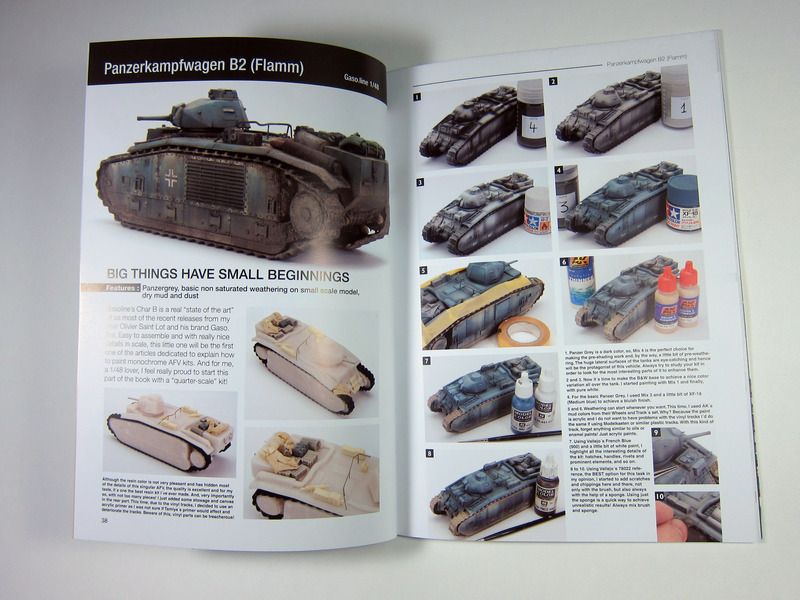 Histoire & Collections of France has released “Painting Guide for AFV of World War Two and Modern Era” (ISBN 978-2-35250-387-3 ) which features step-by-step chapters detailing the application of the Black and White technique to 5 models in 1:48 and 1:35 scale. 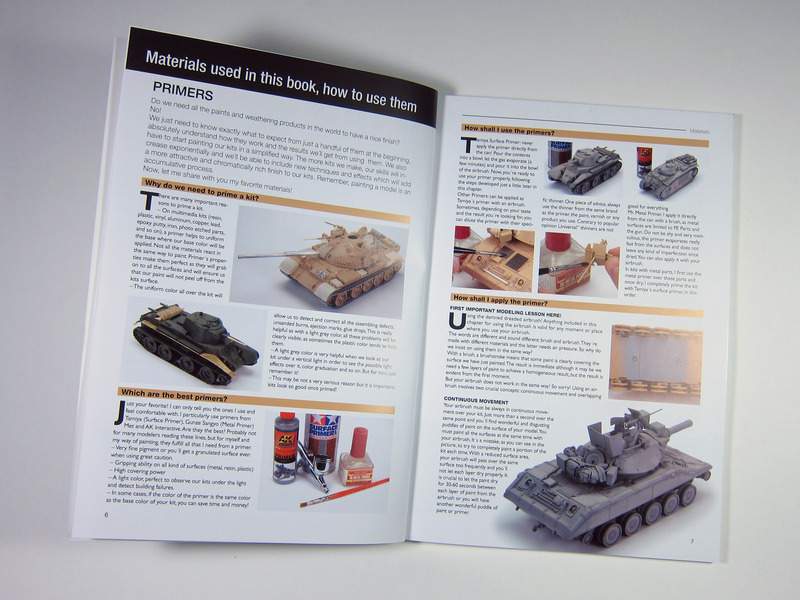 Published in English, well-illustrated and captioned, and written in a relaxed style that could make even an auto service manual fun to read, “Painting Guide for AFV of World War Two and Modern Era” is an invaluable resource for experienced modelers looking to try new techniques, as well as beginning modelers who are trying to unlock some of the more basic mysteries surrounding various concepts and finishes used on pieces that they may have admired in forums and magazines. I feel compelled to point out that this book is not limited to step-by-step chapters, but also features some great stand-alone tables and tips. 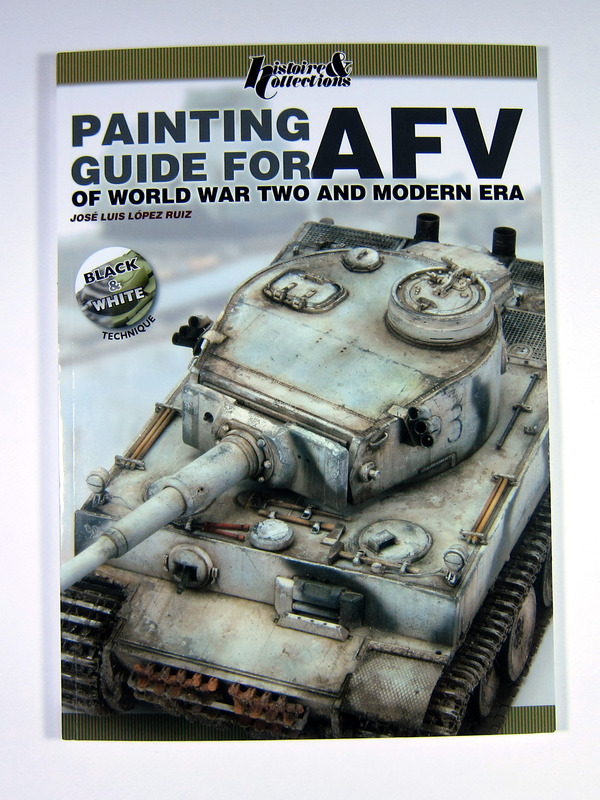 The first 9 sub-chapters are dedicated to particular aspects of AFV finishing: Primers, Paints, Washes, Oils, Varnishes, Pigments, Special Products, Airbrushes, and the Classical Method of painting AFV models. 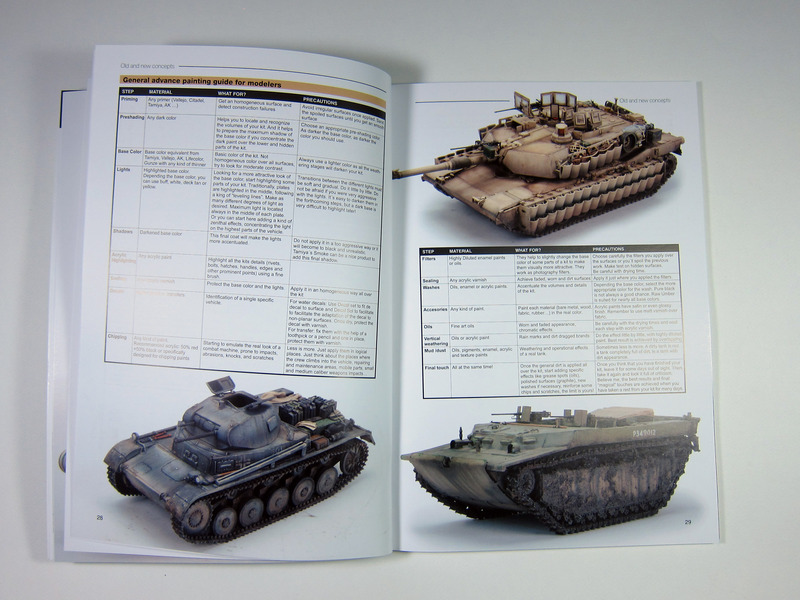 After that, the book turns to an SBS format detailing each of the featured subjects, which thankfully extend beyond the typical German WWII subject and include the following: 1:48 Char B in German service, 1:35 BT-7, Tiger 1, M-1078, and Tiran 5. 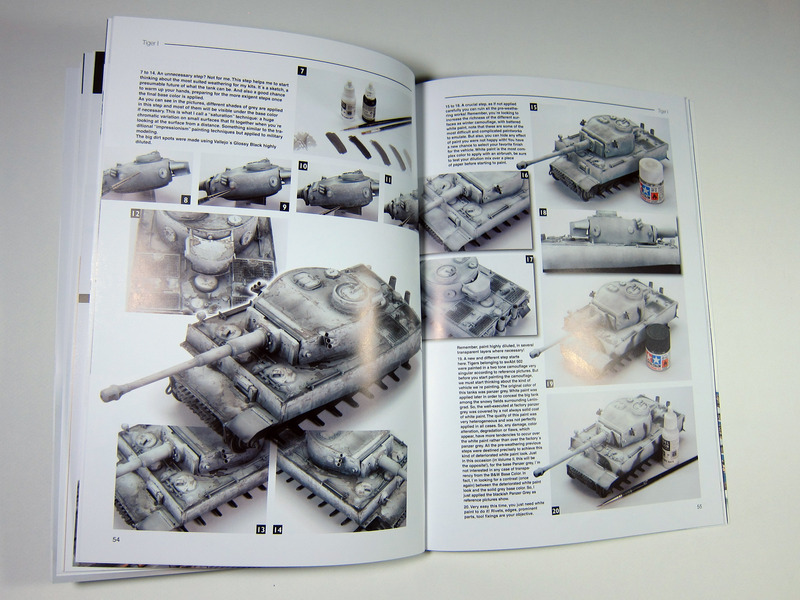 The armor subjects are not limited to those however, as there is also an extensive chapter devoted to an introduction to the Black and White technique that features Jose Luis’s well known T-55 Enigma in 1:35 scale. 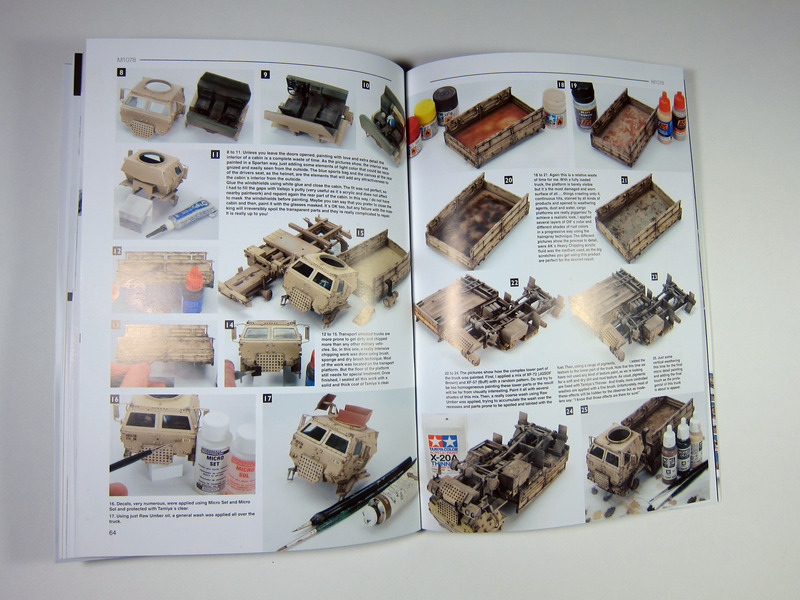 The book finishes off with a gallery of 14 models. One intangible aspect of the book that I absolutely love are the “hidden gems” throughout the text. Concepts like the use of the under-painting steps as a way to sketch the finish in the early stages, while the finish is still in development, are the kind of breakthrough concepts that make a book like this more than worth the purchase price. Jose Luis encourages the modeler to loosen up and embrace risk, echoing admonishments from instructors during my art school days when I struggled to “Stop thinking like an engineer all of the time!” as one teacher advised during a critique. Maybe that’s why Jose Luis’s writing seems so familiar to me. While he definitely encourages the reader to study photographic references and to think logically about the what’s and why’s of various materials and processes, there is a relaxing quality to the writing that encourages exploration and development without fear of “screwing it up” – a tough sell for a modeler who’s just spent months of free time gluing and soldering tiny bits of expensive resin and brass to a $60 plus kit! But like a good teacher, Jose Luis reminds the reader that self-confidence and faith are equally important additions to the modelers tool kit, and that the whole point is to have fun! In the end, it’s hard to argue with his results. 82 full-color pages, richly illustrated and printed on heavy matte paper. Highly recommended! Sunday, August 3rd at 6PM Eastern, I will pick one name at random from the list of people who have shared this post, or the Facebook link to this post. That winner will receive a copy of the above title absolutely free! Thanks for looking – now go build read something!